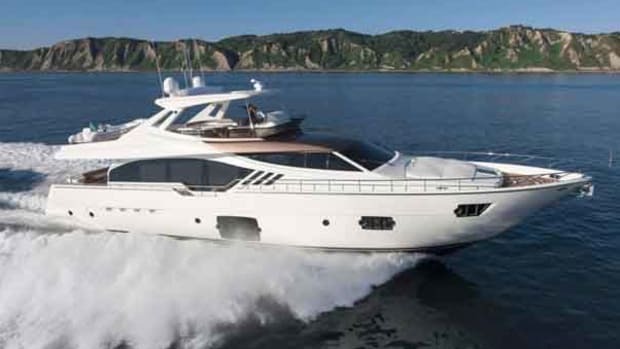 Ferretti designed its new 750 with options that broaden its appeal on the world stage. And Americans? Well, apparently their concern for the crew’s comfort verges on the socialist, while Mom likes to do the cooking. 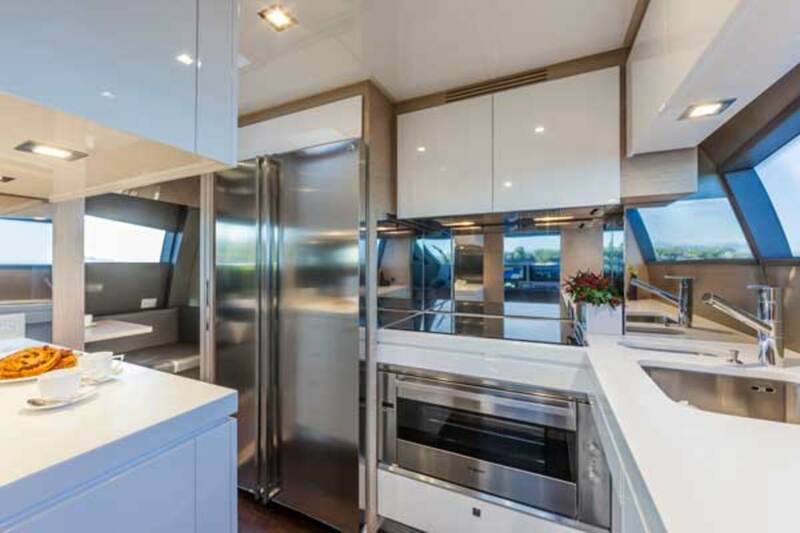 That means an open-plan galley on the main deck, and that is what Ferretti Yachts confidently expects you to order on its new 750, which was launched last September at the Cannes boat show. 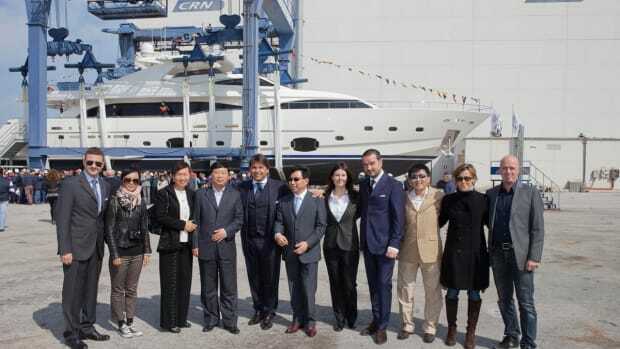 A development of the successful 720, the new model spearheads the Italian boatbuilder’s latest thinking when it comes to international sales. And there’s much more to this thinking than a nod to U.S. catering habits. 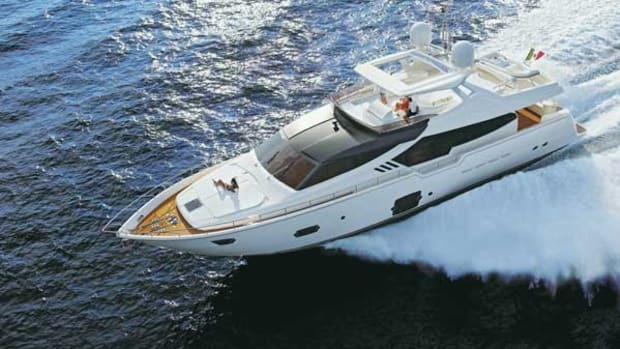 The yacht is available with three alternative flybridge arrangements—hardtop, roll bar or bimini—the option of an open or enclosed galley and a radical two-cabin layout for the Far East that sees a big circular dining table dominating the main deck, a karaoke lounge in place of the master suite and the galley where the starboard guest cabin should be. 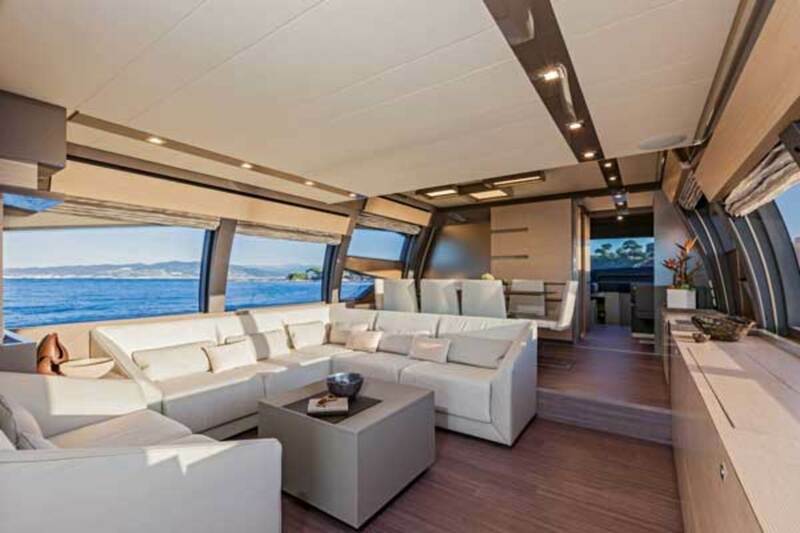 A view of the Ferretti 750&apos;s stylish deck salon, with its substantial windows, clean lines and designer furnishings. Note the tumblehome in the sides, which makes the outside look sleeker. 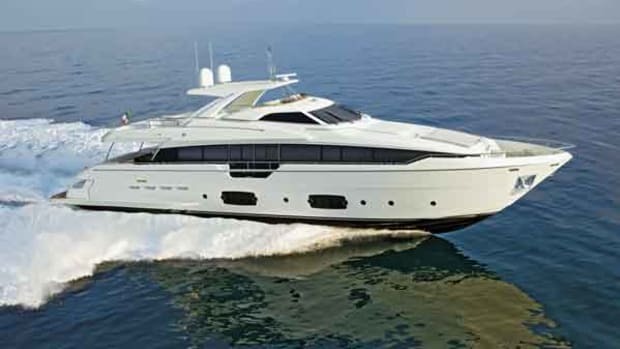 That’s something I’d like to see, but the 750 on display had the standard Euro layout, with four cabins down below, a roomy deck salon and comfortable dining area—which are both thoroughly drenched in daylight thanks to gigantic windows—and the sporty-looking low-profile flybridge. 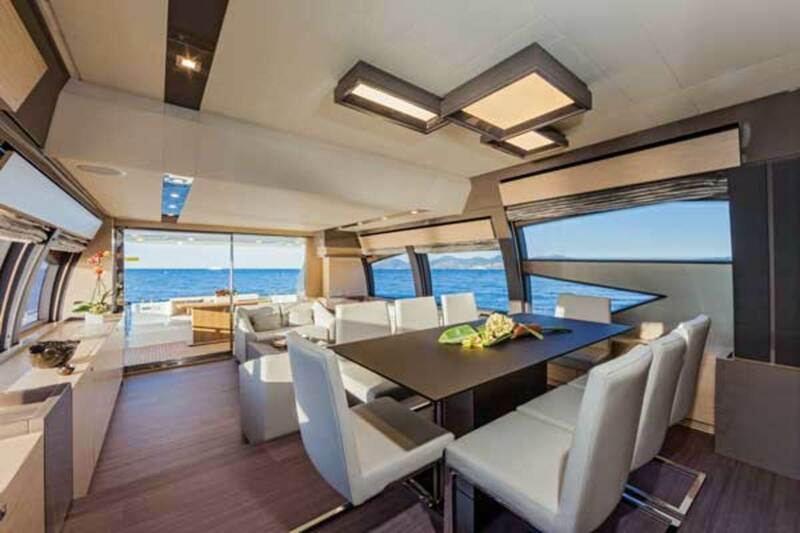 The interior was finished to Ferretti’s usual excellent standard in oak and gray lacquer, with plenty of high-quality designer furniture from the likes of Cantori, OmniDecor and Calligaris. 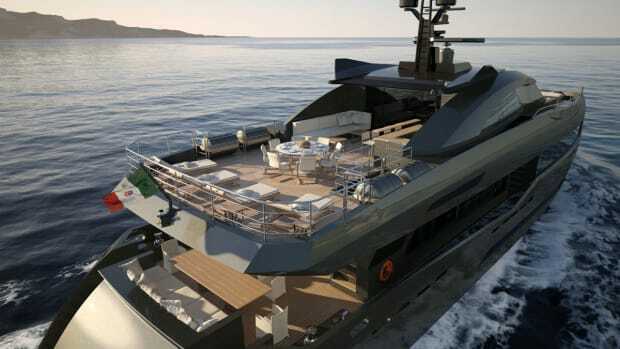 A noticeable difference between this yacht and the one it replaces is the large hydraulic platform aft, which can take a 12-foot tender weighing up to 1,000 pounds. 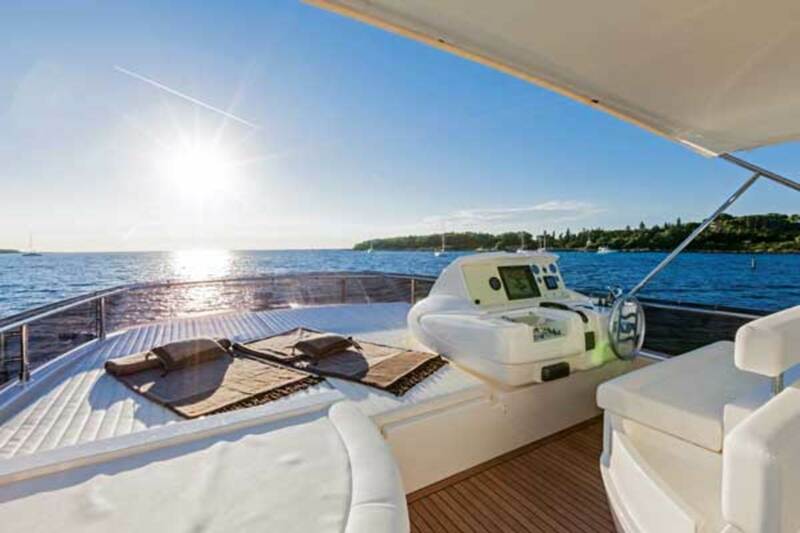 The flybridge boasts this impressive and sociable expanse of sunbed, plus the options of a rollbar, bimini or hardtop. One thing that hasn’t changed on the 750 is the pronounced tumblehome in the superstructure, which makes the main deck feel a little less luxuriously large than it might otherwise. The VIP cabin in the bow is also slightly smaller than you might expect—but not problematically so, unless you’re taller than 6 feet 2 inches, in which case your feet will dangle over the end of the bed. Of course, the other side of that coin is the impressive size of the master suite. The rest of the yacht feels pretty roomy as well. Headroom everywhere is at least 6 feet 6 inches. 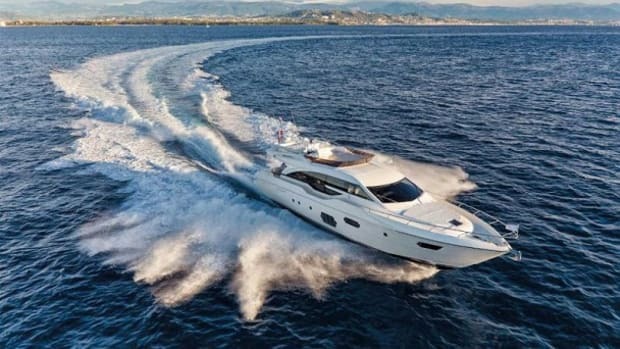 Although in most respects a standard boat, the Ferretti 750 shown in Cannes did have the larger of the two engine options—more than 3,000 horsepower. We recorded a two-way maximum speed of 33.1 knots, which was impressive considering the conditions (choppy), our fuel load (a ton and a half), water level (almost a ton) and the number of people on board (10). The MTU V8s provide plenty of mid-range torque and the sort of responsiveness to the throttles that makes driving fun. ZF electronic SteerCommand technology performed the same function at the helm, giving the yacht lively and precise handling. The trim tabs proved extremely effective, and we needed them thanks to the thousand-pound tender perched right aft. With the flaps down, we were able to hold the hull easily on plane at 16 knots. They were also useful upwind to keep the bow down and bring the hull’s finer forefoot sections to bear against the seas. 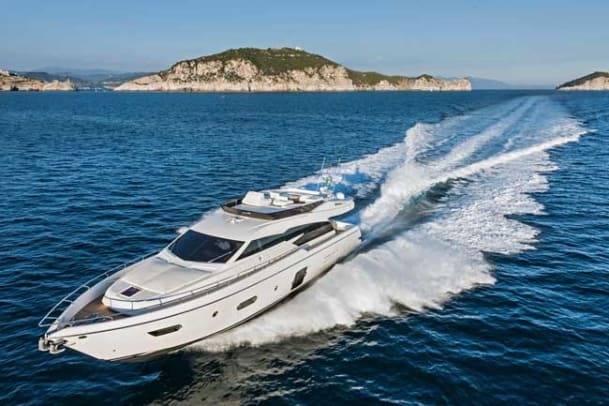 With its new 750 model, Ferretti has taken an already impressive machine and made it markedly better, emphasizing its improved tender-handling arrangements, its bewildering variety of layout options and numerous smaller refinements. 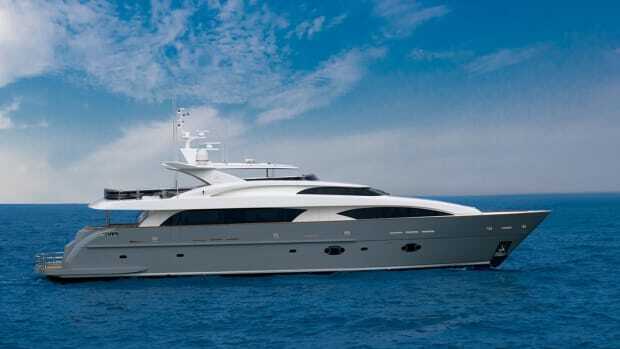 It’s a coolly styled and beautifully finished yacht that performs extraordinarily well. 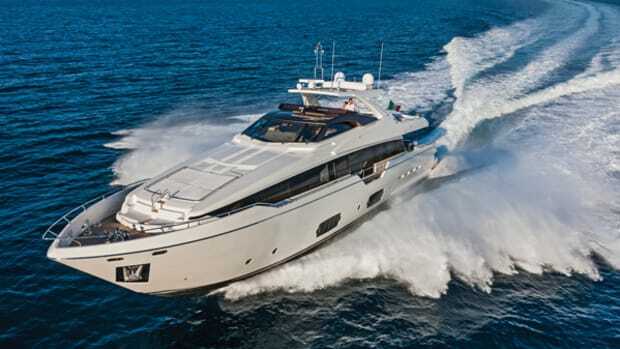 It’s tempting to describe it as an exemplary Italian motoryacht—but that would be a stereotype.